This peaceful scene of the Roman Temple remains in the village of Riez, Provence in France, is timeless and inspiring. The Roman Temple remains of Riez in the Alpes de Haute region of Provence, France makes a peaceful scene in its solitude. 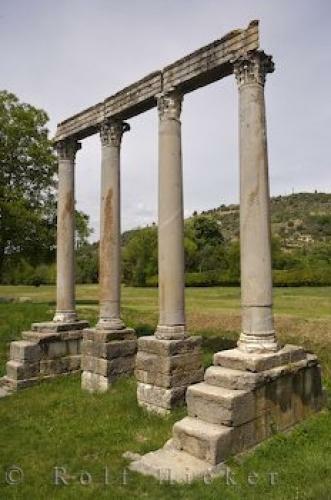 The four columns left from the 1st century are inspiring in the world of today.Columns of the Roman temple remains, colonnes romaines, from the 1st century near the river Colostre in the village of Riez, Alpes de Haute, Provence, France, Europe. remains in Riez, Provence in France, Europe.